In addition to herding dogs, Keepstone Farm has sheep, ducks, and cattle for training and trials. We also have Great Pyrenees dogs and llamas to protect the livestock from area predators, which are foxes, coyotes, and especially, at-large pet dogs. We do sometimes have ducks, lambs, and dog-broke adult sheep for non-breeding situations, for sale. 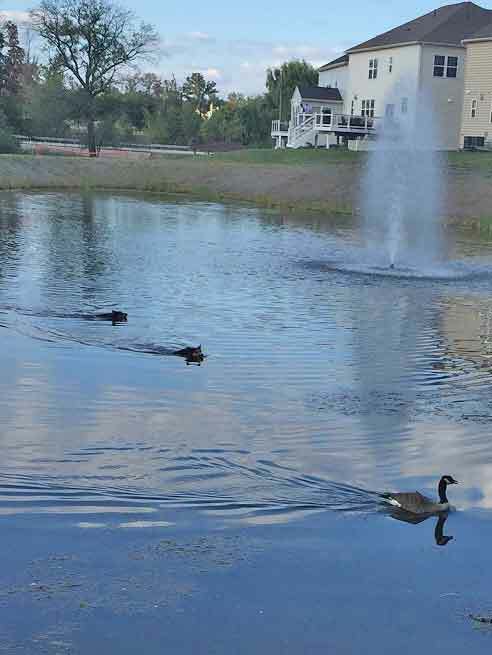 Additionally, we offer practice sessions with ducks, cattle, and sheep. If you are interested, please contact Susan for current availability and fees. Now Selling Fully Trained Goosedogs and Duck Demo Dogs! A core flock of about 125-150 hair sheep is kept at pasture year round, with the number soaring during lambing. Hair sheep, unlike wool sheep, have a summer coat of hair, not wool. 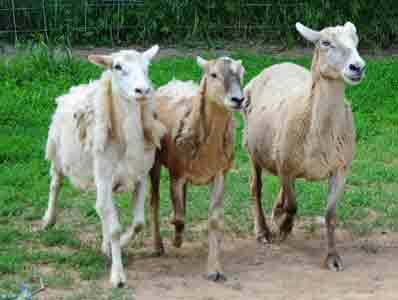 They also have the advantage of shedding their winter wool coats, needing no shearing. When they are shedding in the spring, they can look very bedraggled for a while. This is normal and no cause for alarm. In their slick summer coats, it is not uncommon for the uninitiated to mistake hair sheep for goats! 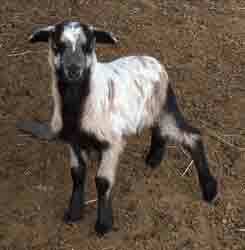 Just remember that goats have upright tails, drooping ears, and beards. Sheep have hanging tails (or docked tails for hygiene), ears held out to the sides, and no beards. Also, both ewes and rams can have horns if it is a horned breed. The lamb pictured below is a sheep, not a goat. The sheep are primarily Katahdin or a Katahdin/Dorper cross with some African, Painted Desert, St. Croix, or Barbados Blackbelly crossing also, and are of medium size. Sheep used for herding are the ewes and wethers (castrated rams), not the rams. Our lambing season is late winter. During the late pregnancy of the ewes and while the ewes are nursing, so we suspend onsite trials for four months and the wethers step in full time for training. This gives the lambs plenty of time to grow before weaning and the ewes can regain condition (mothering lambs can be very draining) before returning to herding duty (training and trialing). Dog broke sheep are occasionally for sale. Please contact Susan for availability. Keepstone uses call ducks in the duck classes. Keepstone maintains a small herd of cattle, just large enough for training stock dogs on cattle and for cattle classes. The herd is usually made up of Holstein, Angus, Black Baldy, and Belted Galloway. All of our cattle are acquired as calves and raised here on the farm. Susan regularly works the cattle as they grow and so they are dog-broke. 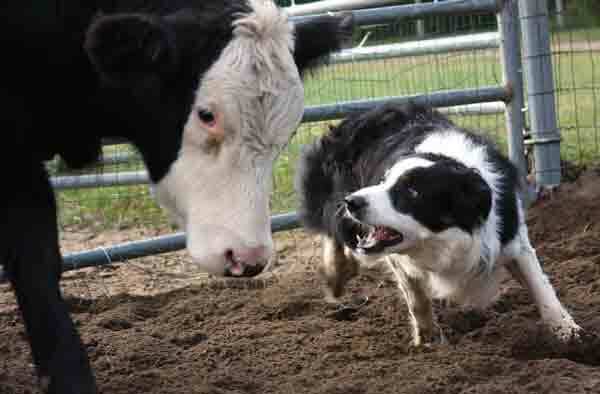 Cattle work is not for every handler and dog, but we wanted to be able to offer the opportunity to those who have a dog that has what it takes to pursue this aspect of herding. To help protect the sheep and poultry from predators, Keepstone may have Great Pyrenees dogs in with some groups of sheep or poultry. Please don't enter these fields with your dog without checking with Susan, first. 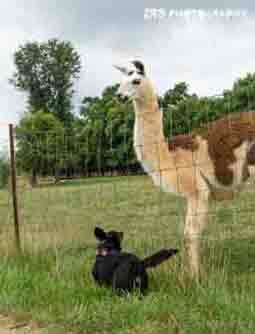 To also help protect the sheep from foxes, coyotes, and at-large pet dogs, Keepstone has guard llamas living with some groups of sheep. Pet dogs allowed to roam cause the most sheep injuries and deaths for us. 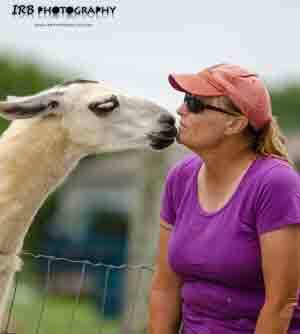 Please don't enter llama-guarded fields without checking with Susan, first. Copyright Susan Rhoades. All rights reserved.